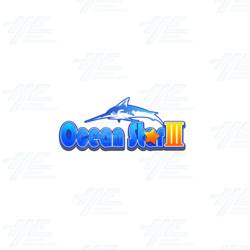 The Ocean Star 3 PCB Upgrade Kit is an English version game board that supports 4, 6, and 8 player video redemption arcade cabinets and uses a marine theme. This game is the next in line in the Ocean Star series, returning in 3D HD graphics, and has made many changes to it's predecessors for a new, fun, and exciting game. The oceanic themed game has a range of breath-taking scenes for players to enjoy. To start the game, players simply insert credit and control their net gun using the joystick and shoot button. They can also change between weapons during the course of the game, changing the strength of the gun up to as high as 1000x power. Once players have a target in their sights, they hit the shoot button to try and catch the fish that swim across the screen. Players will earn points for all the fish they catch and will receive a payout at the end of the game. Players will be trying to catch a range of fish characters, including: Lion fish, Flying Fish, Lantern Fish, Jellyfish, Butterfly Fish, Sea Turtles, Flat Fish, Sharks, Clown Fish, Stingrays, Fugu, and the character feature - Big Whale! There are also a number of game features to make game play more difficult and to help players earn more points/tickets, including: Fish King, Lightning Effect, Golden Shark, Alloy Strength, Biochemical Bullet, Super Weapon, Fish Group, Electronic Power Weapon, and Fortune Wheel. This super fun game is easy to understand, but with challenging features, making it suitable for all ages and skill levels. Players will love the bright and colourful cabinet artwork, drawing in players from all across the floor. This game is the next in line in the Ocean Star series, returning in 3D HD graphics, and has made many changes to it's predecessors for a new, fun, and exciting game. The oceanic themed game has a range of breath-taking scenes for players to enjoy. To start the game, players simply insert credit and control their net gun using the joystick and shoot button. They can also change between weapons during the course of the game, changing the strength of the gun up to as high as 1000x power. Once players have a target in their sights, they hit the shoot button to try and catch the fish that swim across the screen. Players will earn points for all the fish they catch and will receive a payout at the end of the game. Players will be trying to catch a range of fish characters, including: Lion fish, Flying Fish, Lantern Fish, Jellyfish, Butterfly Fish, Sea Turtles, Flat Fish, Sharks, Clown Fish, Stingrays, Fugu, and the character feature - Big Whale! There are also a number of game features to make game play more difficult and to help players earn more points/tickets, including: Fish King, Lightning Effect, Golden Shark, Alloy Strength, Biochemical Bullet, Super Weapon, Fish Group, Electronic Power Weapon, and Fortune Wheel. This super fun game is easy to understand, but with challenging features, making it suitable for all ages and skill levels. Players will love the bright and colourful cabinet artwork, drawing in players from all across the floor.